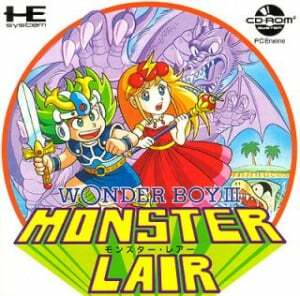 Before you get excited, this isn’t your traditional Wonderboy adventure. 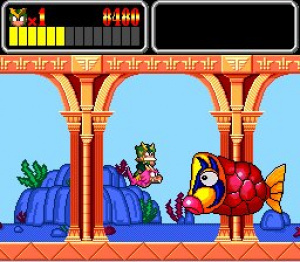 Although we’ve already been blessed with Virtual Console versions of the quite frankly sublime Wonderboy in Monsterworld (Genesis / Mega Drive) and the exceptional Dragon’s Curse (which is essentially Wonderboy III: The Dragon’s Trap), Monster Lair is an entirely different proposition; it’s more akin to the first Wonderboy game with some side-scrolling shooter sections thrown in for good measure. To begin with, Monster Lair is a lot of fun. You run and jump along in a rather jolly fantasy landscape, taking out some cuddly-looking enemies and picking up various items of fruit. Every now and then you take to the skies in shoot ‘em up levels – these also end with a boss encounter. Then it’s on to the next level…and the next…and the next. Monster Lair’s biggest fault is that it’s painfully repetitive. Aside from a smattering of power ups there’s little variety of depth on display here; the lack of any discernable challenge doesn’t help either. You will breeze through the levels without any trouble, but it’s doubtful you will ever complete this game as it becomes too monotonous towards the end, with each level playing almost identically to the next. While it's always nice to see some crossover when it comes to game genres, the combination of shooter and platformer is pretty unsuccessful as neither aspect is anything more than average. 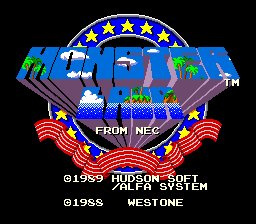 Ccompared to the likes of Sonic or Mario, the plaforming sections of Monster Lair are pretty insipid. The same goes for the shooter component -- put this next to Axelay, Soldier Blade or Blazing Lazers and it all looks very poor to say the least. Needless to say this is million miles away from the platform RPG excellence of the previously mentioned Virtual Console stablemates and lacks the knockabout charm of the original Wonderboy (Monster Lair’s closest relation in terms of concept). This game was also released on the Mega Drive and is equally uninspiring. The TG-16 has a slight edge over the Sega version thanks to the lovely CD soundtrack: it's not the best music you will ever hear in a videogame but it's nice all the same - very jolly and uplifting! 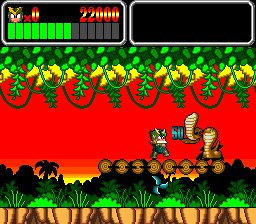 If you’re a complete Wonderboy fanatic then you may extract some enjoyment from this rather limp piece of software; anyone else should ignore it and pick one of the other games in the series. Ouch! This is one I'll be skipping. At least it's better than the other version. IMO it deserves at least a 6. The game does get monotonous but at least it has better controls, music, and levels than that crappy Genesis port.